Big Brother Canada is back for it’s third season. Your response to our coverage last year was so great we decided to step it up this season. For the first time we are providing you with Live Recap shows every Friday at 3pm EST. Join Jon and I every week as we comedically recap what happened. From nominations to eviction we will give you our funny take on the weeks events. Join us live or watch the show later but either way tweet them using the #YRRLive with your questions and comments. These shows are for you and we want to discuss the things you want to hear about. We also will be including our interviews with the evicted houseguest. Every Wednesday night tweet me your questions #YRRLive and we will try and ask them. Just don’t forget to subscribe to our YouTube Channel so you don’t miss a show. I am also writing recaps blogs this season Follow us on Facebook, Twitter, Instagram and Google+ that way you’ll never miss a show or a blog! 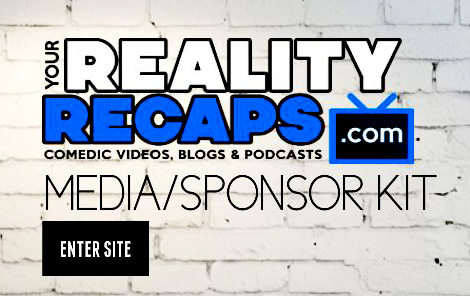 Don’t forget to subscribe to the Your Reality Recaps YouTube channel and thumbs up our video! That really helps! Of course you can always make a donation via pay pal or become a patreon to get exclusive content and help support our shows. You can also start your online shopping by click on the Amazon ad in the side bar, or go there now! You pay no more money and they continue to sponsor us. It’s thanks to your support and donations that we can keep providing you with all the content weekly and we are so grateful for your support. But ok, what are you waiting for? Go check out this new show and let me know what you think in the comments section below.